Bringing symmetric harmony and a sleek outline that combines style and function, plantation shutters are a popular element of contemporary interior design. They are window coverings made from a fixed frame inside which there are adjustable sets of slats, called louvers, that can be moved up or down to vary the amount of light coming into a room. Their timeless appearance conveys warmth and elegance, and inspires visions of the Mediterranean Sea with sandy beaches and charming villages mounted on steep cliffs. Characteristic to warm climates due to their insulating properties and durable structure, shutters were brought to other parts of the world by European colonists, including the US, South Africa and Australia. Nowadays, their distinctive slat system that rotates to adjust the luminosity within a space is easily recognizable and is employed in a variety of decorating solutions, as it always adds a dash of intimate coziness. The term plantation channels the era of the British Empire’s peak when the multicultural colonial look was coined. Bringing together design elements from all over the world, such as bamboo, rattan or cane furniture, dark floors, tropical animal prints, high ceilings, foldable chairs and so on, this style included the use of plantation shutters for both doors and windows. That is why their hefty appearance and traditional décor go hand in hand. Throw in a few exotic porcelain items and some potted palm trees to liven up the neutral palette of your classic furnishings, and there you have it: a full-fledged colonial-inspired home. The stark geometric flair of horizontal louvers and vertical frames beautifully accompanies contemporary designs as well, which are characterized by simple lines, easy-to-clean surfaces and casual colorations. Both natural and tinted slats are suitable for modern homes, but if you are going for a true youthful spirit, try bold, unexpected pigments like teal, green or purple. White shutters also complement current trends, generating a crisp clean ambiance. Offering the chance to showcase the richness of natural essences through the width of the slats, wood plantation shutters have the ability to elevate the look of your home interior. They can be used in conjunction with other organic elements, such as hardwood floors or heavy furniture items, to heighten the design; for a pleasing contrast between the precious grain and neighboring surfaces, pair this type of window fashions with brighter wall paints like snow white, pearl gray or sky blue. Also, light-toned woods like teak or basswood impart a more youthful, easy-going vibe, while darker ones like walnut or oak inspire a more sophisticated, luxurious style, so choosing the appropriate hues is also important when completing your house decoration. 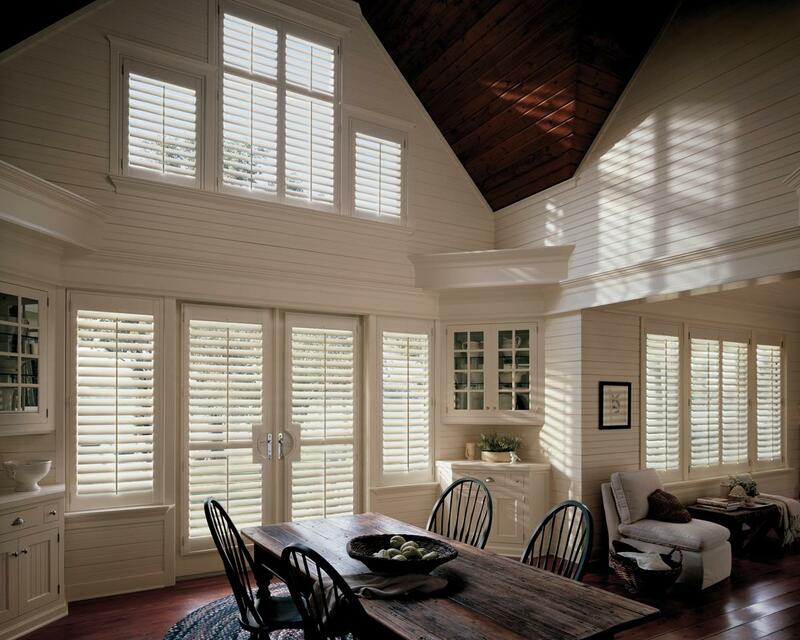 Current technologies are able to create stylish window treatments that avoid the exploitation of precious natural resources, and faux wood plantation shutters are one great example in this respect. They are manufactured from synthetic materials that will resist a lifetime, without breaking, fading or warping; and their resemblance to real wood is uncanny. One great advantage is that these products allow you to make your pick from literally hundreds of essences and stains, some of them being impossible to get from nature. This versatility is further enhanced by the multiple patterns available: matte, polished, brushed, textured and solid. 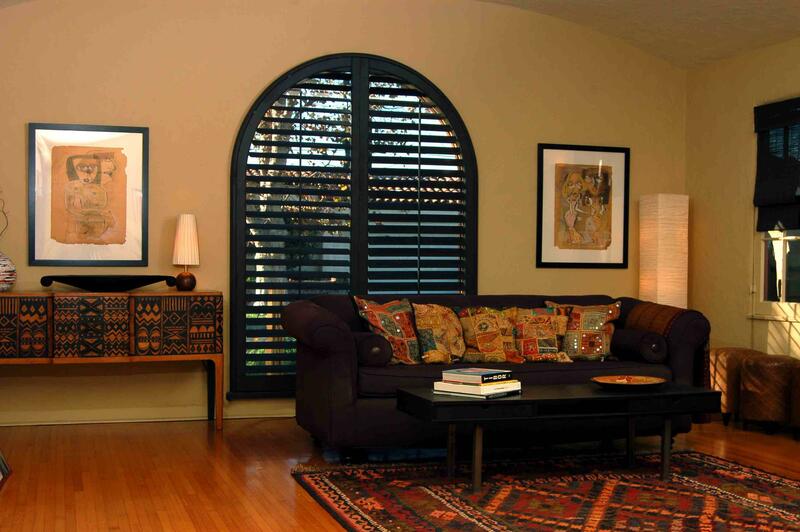 As a result, alternative wood shutters are sure to meet the design needs of even the pickiest decorators. To upgrade the look of your windows in a truly impressive way, install plantation shutters whose slats measure 2 inches in width. This simple, yet remarkable adjustment will make all the difference décor-wise. Larger louvers create a stunning visual focus point and suggest the idea of modern unconventionality. They will also reflect light in a magnificent way, transforming any space into a fresh, reviving area. The only trick is to use them for oversized windows, as small ones can feel unbalanced by the hefty slats. If you are feeling brave enough to go for a dramatic twist over the traditional plantation look, try solid black. This dark color will make your window shutters pop, adding glamour and sophistication to any decorative ensemble. Other furniture or art items in the room will simply become enhanced by being set against the elegant matte finish of the wooden frame and rails. Used for the lounge area windows, this bold color is definitely going to be a great conversation starter next time your friends come for a visit. White has never been more popular among professional decorators, and a simple and accessible way to incorporate it in your own home is to paint the wood shutters with it. It will instantly upgrade a tired space by flooding it with a sense of airiness and contemporary nonchalance. Set against a pastel-tinted wall, this color will make the windows stand out, highlighting the elegance of the louvers. Use it for the floor trims and cornices as well, to create a perfectly balanced appearance. Windows are not the only structural elements of a house whose silhouettes can be jazzed up with shutters. If at least one room within your home has been blessed with elegant sliding doors, then using this type of treatment to dress them will result in a refreshing, sleek design. 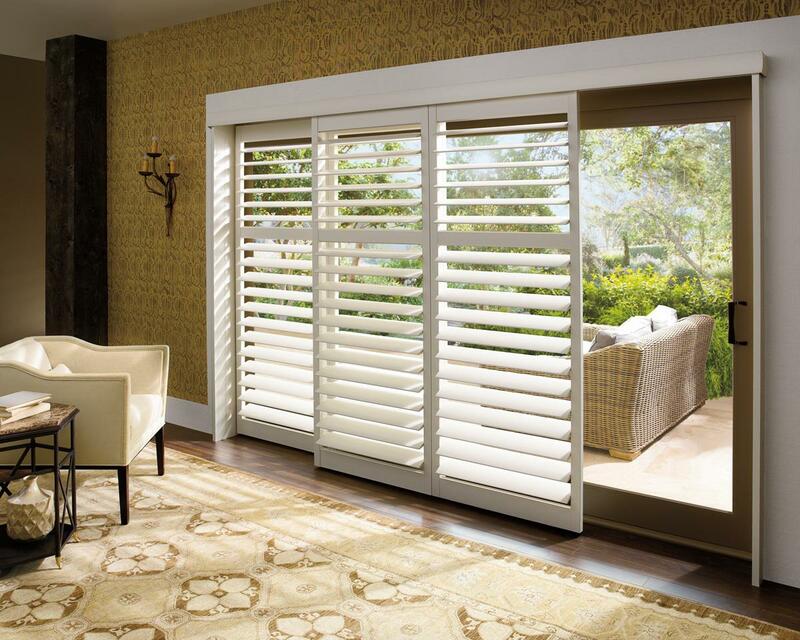 The plantation shutters can be fixed within the glass door frame itself, but for superior versatility and ease, opt for independent rails with a separate gliding system that will allow you to adjust the luminosity and ventilation at the same time. Larger glass areas can accommodate wider slats and rails, while narrow, tall doors are best accentuated with equally narrow louvers. And if you really desire to go over the top, state-of-the-art operation systems can be an astounding addition to your coverings; modern motorized versions enable you to set them to open or close, depending on the time of day or your specific requirements. Shutters provide a stylish way to preserve the architectural authenticity of French doors, without hindering the original design. They can be fixed on the door frame or hinged to open separately, according to your wishes. Moreover, contemporary solutions employ custom cut-outs that do not impede the use of a door handle and blend seamlessly with the overall look; tilt rods can also be hidden behind the slats, for perfect styling. Set up folding plantation shutters to mark the transition between the indoor and outdoor spaces of your house in a truly theatrical way. The sharp angles created by their outswing panels will be subtly balanced by the graciously slanting louvers, resulting in an always-surprising, ever-changing design. Options like operating modes from the sides or center ensure a perfect fit with a variety of furniture arrangements, so that these colonial-style treatments utterly enrich the charm of the space they are used in. 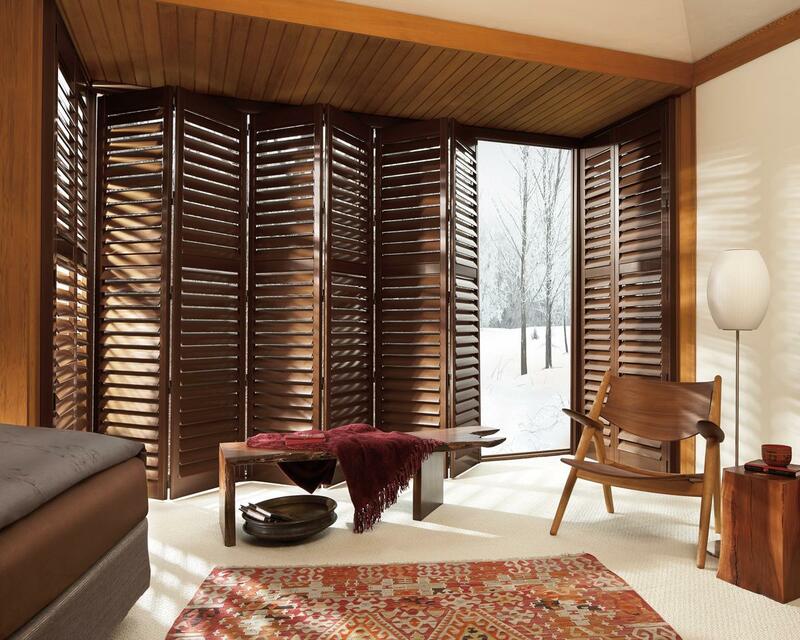 Turn the unusual shaping of your windows into a great structural feature with real or synthetic wood shutters. Their retro appeal will counteract odd angles or outlines, offering instant chicness and making the most of your glass areas and natural light. By diffusing the sun rays in their characteristic manner, the wooden slats will throw interesting shades over the walls, transforming what first seemed as a décor challenge into a truly architectural advantage. Moreover, the symmetry of the horizontal louvers and vertical tilt bars will sweeten any irregularities, resulting into flattering silhouettes. Terraces are great areas for relaxing outside without leaving the comfort of your home and some of you are lucky enough to have them. Whether spacious or modest, they deserve a carefully planned design and attention to detail. And what greater way to highlight these structural gems than fitting plantation shutters to mark their boundaries and increase their attractiveness? Due to the fact that patios are so exposed to the elements, they require durable materials that will keep them in shape and offer protection during storms or strong winds. 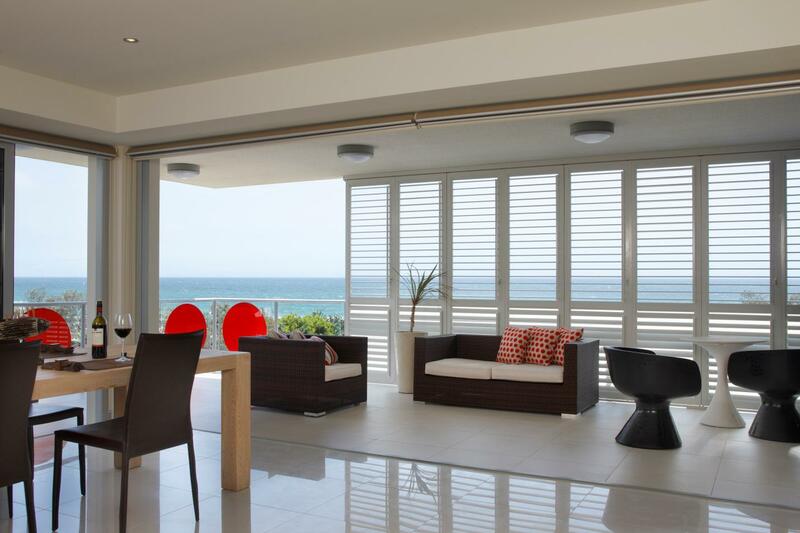 When completely closed, the movable louvers offer great insulation from rain or damp currents, being a perfect solution for beach houses or buildings found in certain parts of the world with high humidity levels. Mediterranean nations have been successfully using these coverings for hundreds of years in order to protect their homes from the scorching summer sun or powerful bora winds, so their tried and true heftiness is a saver. What’s more, contemporary sustainable shutters offer superior vinyl-treated materials that often come with a lifetime guarantee, meaning you will make a great investment. 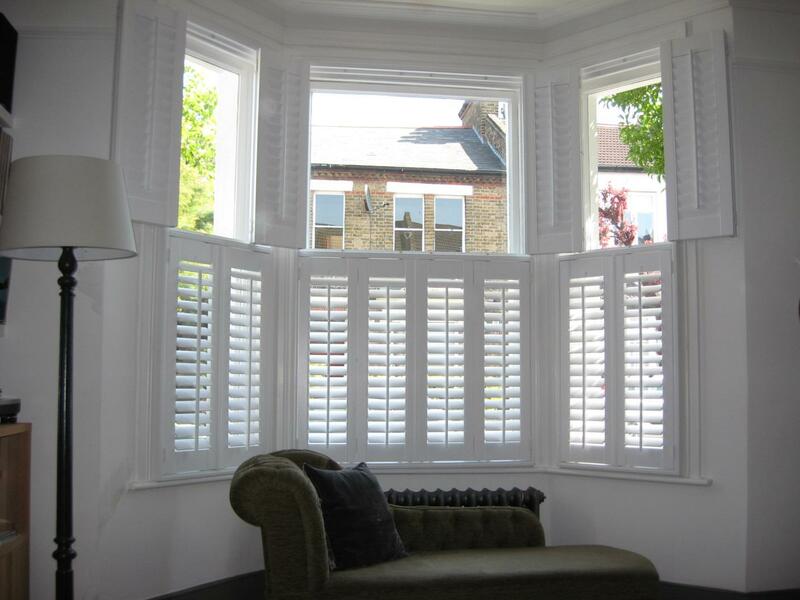 Design-wise, plantation shutters will impart a chic look to your terrace, making it stand out; their gliding or foldable versions will allow you to constantly shift their position and update the décor, while efficiently ventilating the space. Bay windows are total eye-candy and definitely merit a remarkable dressing solution to underline their charming shape. 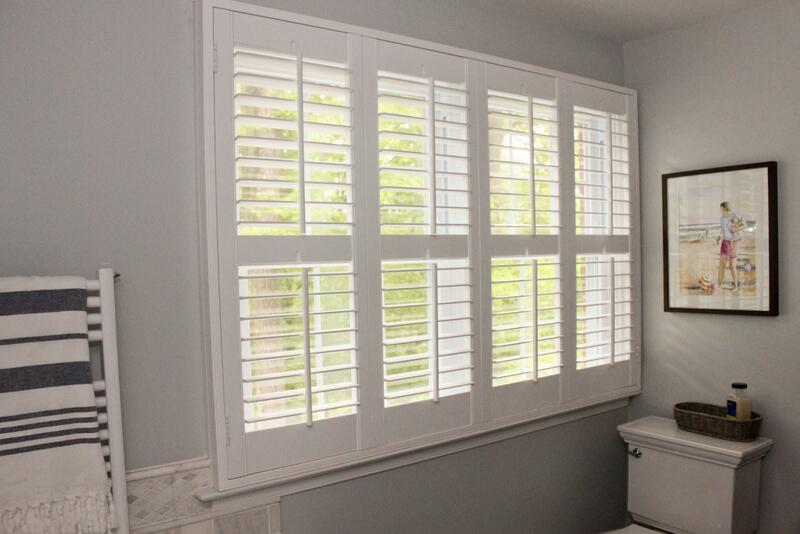 Shutters come with the great benefit that they can be mounted exactly within the window frames, thus emphasizing their original outline. Their horizontal lines provide a relaxing ambiance, diffusing the light in a charming manner, while giving a Parisian-café look. 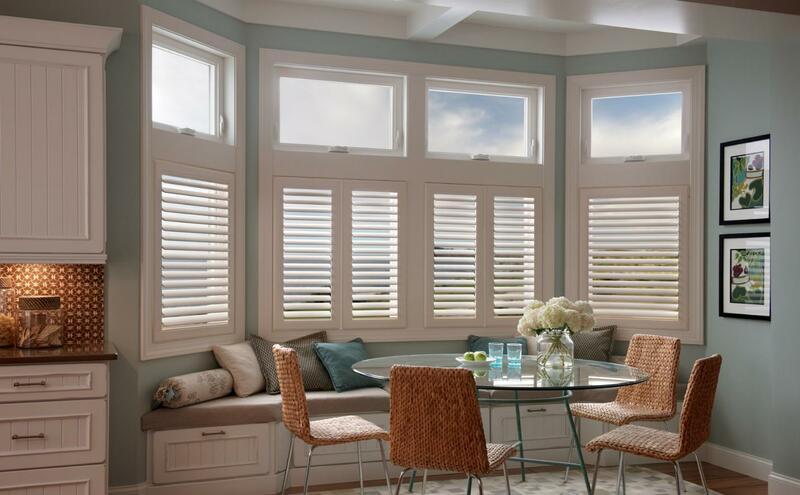 To maximize the amount of natural light entering your house, plantation shutters can be employed only for the lower part of the bay windows, allowing the sun to shine through the louver-free glass surfaces above. In this way, the created nook will appear even more sophisticated. For ultimate privacy, light and ventilation control, plantation shutters can be installed using a tier-on-tier structure that enables the lower and upper halves of the coverings to function independently. In this way, you can darken the space by closing the slats on the inferior segment, while still ventilating the room by keeping them open on the superior part. This operation mode is particularly effective with wide window expanses or tall doors that allow the separate sections to coexist. Bedrooms are those special spaces in your house where you want to keep things calm and soothing, with no loud or attention-grabbing elements that might hinder your precious rest. That includes the bedroom windows where you might need a relaxing, minimalist approach, while taking advantage of the best darkening and ventilating solutions. 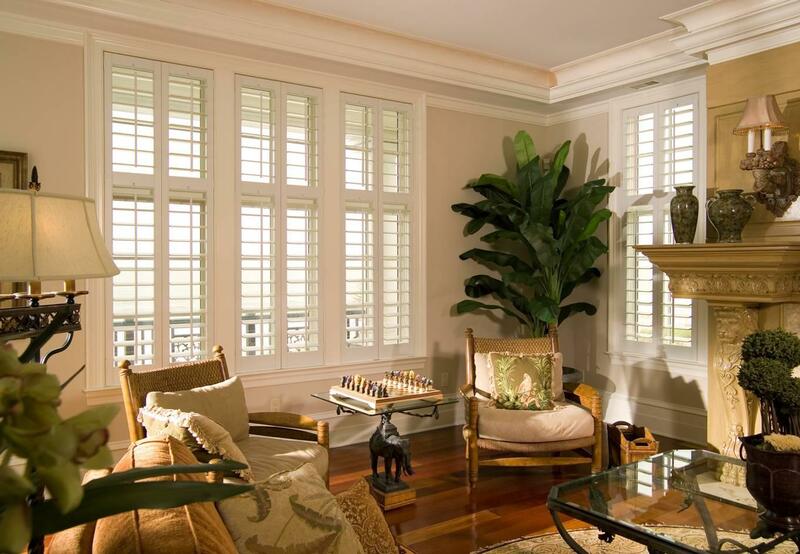 That is why plantation shutters will turn out to be a marvelous pick! The movable louvers and comforting appearance of natural wood combine to give you adjustable light and privacy levels, while delicately lulling you towards a peaceful nighttime or afternoon sleep. You can make your way through the various colors or stains that can match or contrast the other furniture items in the room, to achieve the perfect decorating results. And another great feature is their compact form will not take up valuable inches off your bedroom, like draperies would, for instance; this is especially important for urban households, where sleeping rooms tend to be quite cramped. 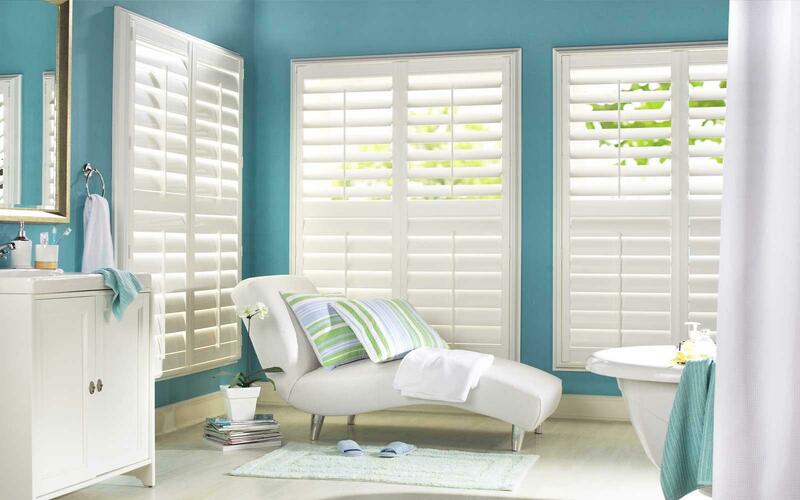 The appeasing stature of plantation shutters could also counteract the starkness of any bathroom, softening the entire ambiance and improving the existent design. They come in waterproof treatments or synthetic materials that will simplify their cleaning process, as all you will need is a damp cloth and soapy water. A great tip is to choose independently mounted tiers in order to provide great ventilation and adjustable levels of privacy. 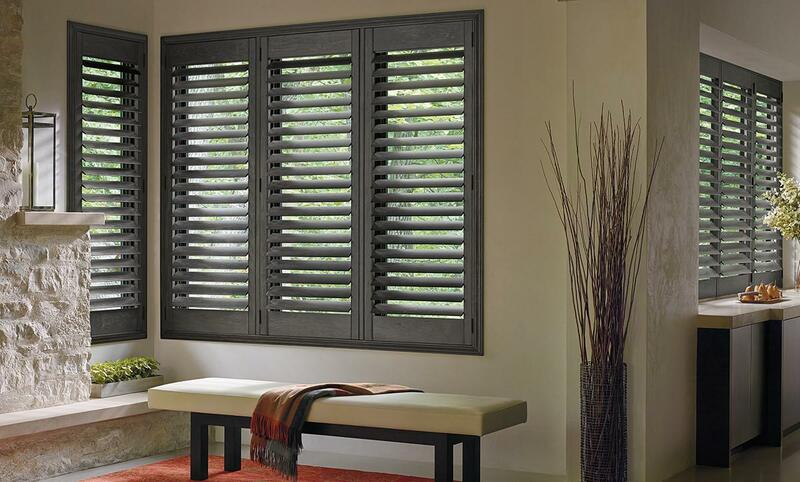 Moreover, shutters are also resistant to high humidity levels, so you literally have nothing to lose. 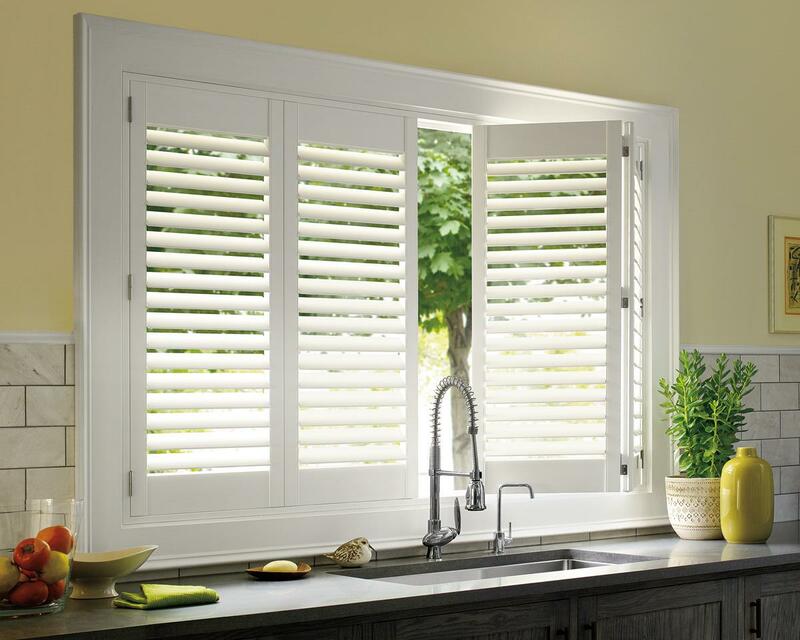 The kitchen is another hardworking space in the house where using plantation shutters will save you time and energy, while making the space feel more cozy and inspiring. Adapt their color to the cabinetry and make sure to pick resilient materials capable to withstand the conditions within this busy part of your home. If your room space is generous enough and want to go one step further with your window styling, then pairing two different types of treatments will add extra charm. 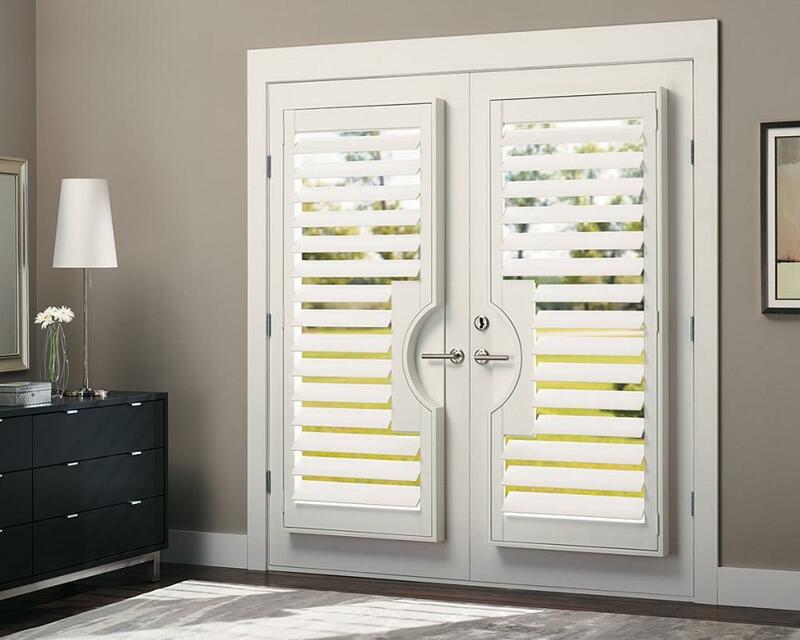 Plantation shutters have a classic appearance that will never grow out of fashion, so you basically cannot go wrong if you choose to pair them with either traditional or contemporary curtains. On one hand, their impressive allure will beautifully complement rich, heavy fabrics like velvet or brocade; these timeless types of draperies work very well with warm wooden textures that enhance their sumptuous lines. On the other hand, more modern versions such as white or pastel-colored shutters create a refreshing visual ensemble with bold, fun-loving drape patterns like chevron, hound’s-tooth or other geometric variations. Small windows require treatment ideas that can balance their undersized shape, giving the illusion of a larger outline. 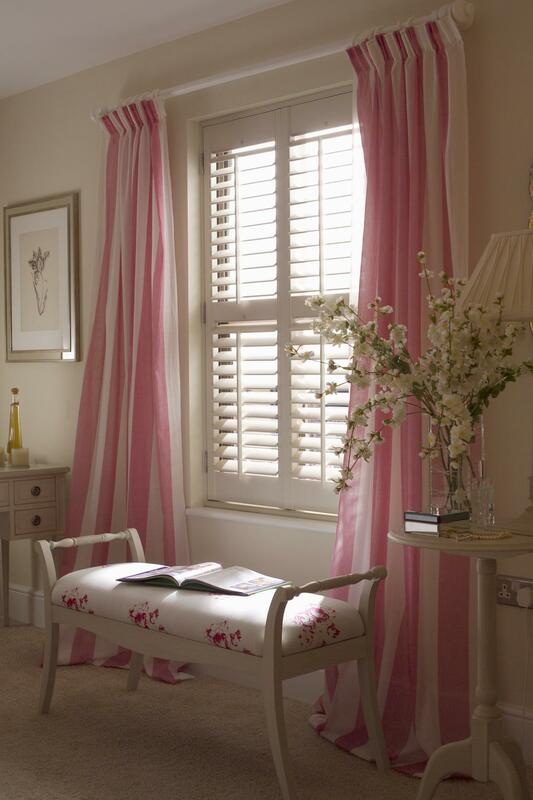 Plantation shutters offer the right amount of symmetry and panache to do just that. First, the horizontal slats and vertical tilt rod will successfully distract the eye from too narrow or too wide a window, resulting in a pleasing look. Second, install a larger shutter frame in order to either elongate or broaden the original form, depending on the situation. And lastly, choose the same treatment for the borders and louvers, to maximize the boost. The wide selection of interior design ideas centered on the use of plantation shutters proves their incredible versatility. Whether it is traditional or contemporary, the character of your home is bound to be enhanced with their impressive appearance and classic allure.